If you are looking for a nursing specialty to pursue that is high in demand and also fulfilling, you may be wondering how you can go from a general nurse to a hospice nurse. 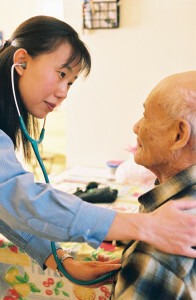 There are a number of different paths that you can take to specialize in hospice nursing. Before you find out the steps you must take, it is a good idea to find out what it takes to work in such an intense setting where emotions run high. Read on, and learn about the roles of hospice nursing professionals as well as what steps these professionals took to work in the specialty. What Does it Take to Be a Hospice Nurse? All nurses need a certain level of compassion, but when you work in a hospice setting you will need to be graceful, positive, and compassionate. Working in palliative care can be extremely rewarding for people who are ready to act as part of a holistic care team who makes the patient’s end of life as comfortable as possible. Many believe that working in a setting where the customer is nearing death can be depressing or hard to cope with. Others see this as a rewarding opportunity where they are making a difference and supporting their patients so they can be at ease at a time where this can be extremely hard. What Type of Education Do You Need to be in Hospice Nursing? Just like a general nurse, you will administer total nursing care to your patients. The primary educational difference between general nursing and hospice nursing is that you will need to earn a Hospice and Palliative Nursing certification. To get certified, you will first need to earn a nursing degree and become a Registered Nurse (RN) by taking the National Council Licensure Examination (please see: How Should I Prepare For My Nursing Board Exam?). After taking the national RN test, you will need to get professional experience in a hospice setting as an RN. In addition to professional experience, you will need some specialty training in a formal setting to be certified. Before you enroll in elective courses or continuing education courses, you should check with your state’s board of nursing to find the accredited courses that focus on palliative care. Most boards of nursing in the US require that you have at least two years of experience before you can test for certification through the National Board for Certification of Hospice and Palliative Nurses. After passing the certification exam, that consists of 150 questions, you will officially be a specialist in the field of hospice nursing. With so many Baby Boomers aging and falling ill, the need for nurses in hospice settings is only projected to grow. Job outlook in the field is very positive and the supply and demand gap is widening to the benefit of nurses who are looking for a specialty to pursue. If you are looking for an in-demand job that does not require much more education than you have already completed, consider what it would be like to work in hospice providing end-of-life care. Make sure that you are realistic about your personality and what it takes to be a hospice nurse so that you do not jump into this challenging field without really exploring your options.